It has become a standard for a drone to pack with a 4K Ultra HD camera. Drones carrying 4K cameras are able to create stunning aerial film, however, the tradeoff is that the output file size can be massively huge. A single minute 4K 2160p footage at standard 30fps and 60Mbps shot by GoPro Karma with GoPro Hero 6 camera is about 450MB, and 4K video at 60fps and a high 100Mbps bit rate recorded by Dji Phantom 4 Advanced requires a whopping 750MB. If you get 10-minute or even longer drone footage in 4K 2160p, which is obviously above the max video upload size limits of Vimeo, Twitter, Instagram, Facebook, Whatapp etc, you'll fail to upload the clip to them and take a few hours to upload to YouTube and email. No problem, let's crack on the tutorial below and learn to compress drone videos without noticeable quality loss. Dronestagram - There's no official upload media document. We uploaded a 12mins 31s 2160p 4K Ultra HD travelling video shot by DJI Phantom 4 Pro to the site, and didn't receive any message telling "the video file is too long". However, it took roughly 10 minutes to process the video. The essential thing to do is to pick the right program. 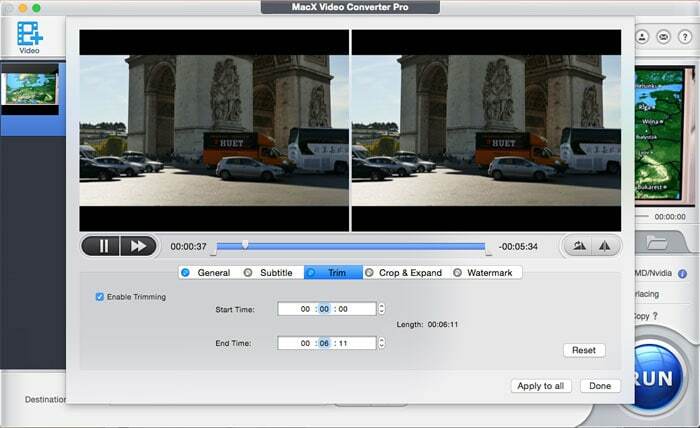 There are dozens of online video compressors for drones, but the desktop software seems a better choice for large video file processing. Many users adopt Handbrake for the job, but finally get lost in the complicated settings or make some of the shoots jerky. 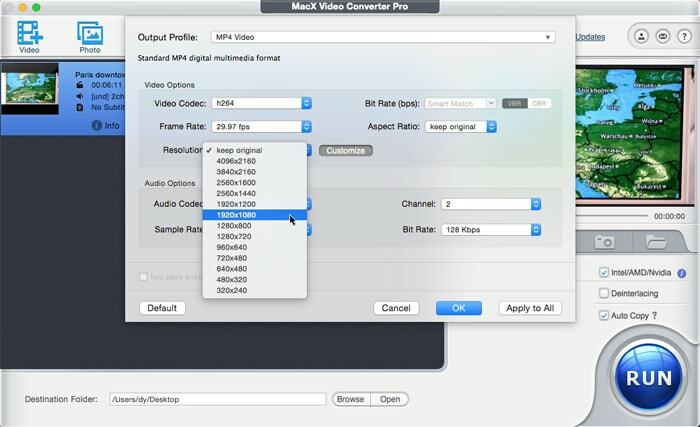 MacX Video Converter Pro is the most powerful desktop video compressor out there, which can achieve the highest quality of drone videos at the smallest file size - up to 90% compression ratio. You are allowed to compress drones videos without losing quality by trimming and cutting and to reduce size without greatly affecting quality via lowering down bit rate, frame rate, resolution, converting format and more. Launch the video compressor for drones on your computer. Click Add Video icon and select videos if have transferred clips from drones to the computer. Export settings vary based on different purposes. This tool allows you to add multiple drone clips at a time. Drone footage file size is determined by bitrate you set and length of the video you record. There are many factors affecting bit rate, like resolution, frame rate, codec, to name a few. Here are some tips you can use for drone video compression. Some modern codec formats use better compression algorithms, resulting in higher quality, but lower bitrates and smaller file size. For example, H.265 is half the size of H.264, with the same quality. Most drones from Dji, GoPro, Parrot, Yuneec, Walkera etc. supports MP4/MOV (AVC/H.264 or/and HEVC/H.265). For models like Dji Mavic Air/Pro, Dji Inspire, to name a few, which don't support HEVC recording, you can convert 4K videos from H.264 to H.265 to get smaller file size. Check our list of top lossless codecs for video compression. If you compress videos from drones for uploading to YouTube or other video platforms, you can convert drone videos of MP4 or MOV format to FLV for smaller size. It's worth noting that codec format conversion will lead to quality loss. The good news is that the tool ensures the best possible quality and the fastest speed thanks to built-in High Quality Engine and support for AMD/Intel/Nvidia hardware acceleration. After you've settled down with video format, click OK to save the settings, and then click or icon to do further compression, you'll get options to trim, cut, adjust bit rate, resolution, frame rate, sample rate etc. Lowering down the bitrate will make videos recorded by drones smaller. Click icon after you picked a video format, find Bit Rate under Video Options and enter the bitrate you want, the same goes for audio bitrate. You can just skip this part if you have no idea what bitrate to choose since the bitrate will automatically be decreased when you adjust video resolution, convert video format etc. Note that lower bitrate equals worse quality. Also look at the list of recommended video bitrate for social platforms below. Recommended Facebook video bitrate: 8Mbps for 1080p, 4Mbps for 720p, there's no bitrate limit the file that uses 2-pass encoding is less than 1GB. Instagram video bit rate: 5,500 Kbps or 3500Kbps. YouTube video bitrate: It varies based on video frame rate and resolution, check the best upload encoding settings for YouTube. Now, most recent drones from Dji, GoPro, 3D Robotics, Parrot, AscTec feature 4K cameras. 4K videos are four times of 1080p in file size. To compress large 4K drone videos, it is a good way to go to convert 4K UHD to 1080p resolution or lower. To do so, click Resolution drop-down icon under Video Options and pick one from the list. You can change other parameters on the Settings Window to make drones footage smaller, like frames per second, audio sample rate, and audio channel. Most cameras for drones offer a wide range of frame rate options, including 24, 25, 30, 48, 50, 60 and even up to 120fps. 30fps is the standard for video platforms like YouTube, Facebook, Vimeo, Instagram. Do not make over adjustments. Improper frame rate adjustment can result in jerky or messed videos. This is a highly recommended way to compress drone videos without losing quality. The tool lets you remove extra footages like takeoff and landing, as well as cut unwanted edges to reduce drone video size without sacrificing any video audio quality. After all the settings are finished, click RUN button at the bottom left corner to process drone video compression. 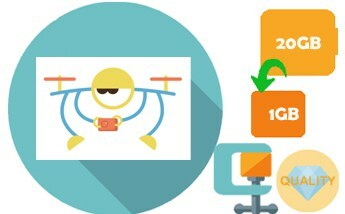 The time it takes to complete the compression depends on video size, computer performance and video settings. Here's our pick for the best free video compression software. Follow these tips and tricks to reduce video file size. The most-downloaded video compressor for macOS. Follow to compress videos for much faster emailing.